It's very sturdy: reputed to hold 50 lbs. I haven't really measured the weight of what I've loaded in there, but I've definitely come close to that limit. Capacious! The basket holds several bags of groceries, or my large purse & two preschooler backpacks, or all our bike helmets, or four giant loaves of bread from Costco, or a case of baby wipes, or two cases of beer... I could go on. Stable. Besides being made of thick aluminum, the basket attaches at four points to the frame of the bike, not the handlebars. This means that whether it's fully loaded or not, it doesn't impact your steering at all. 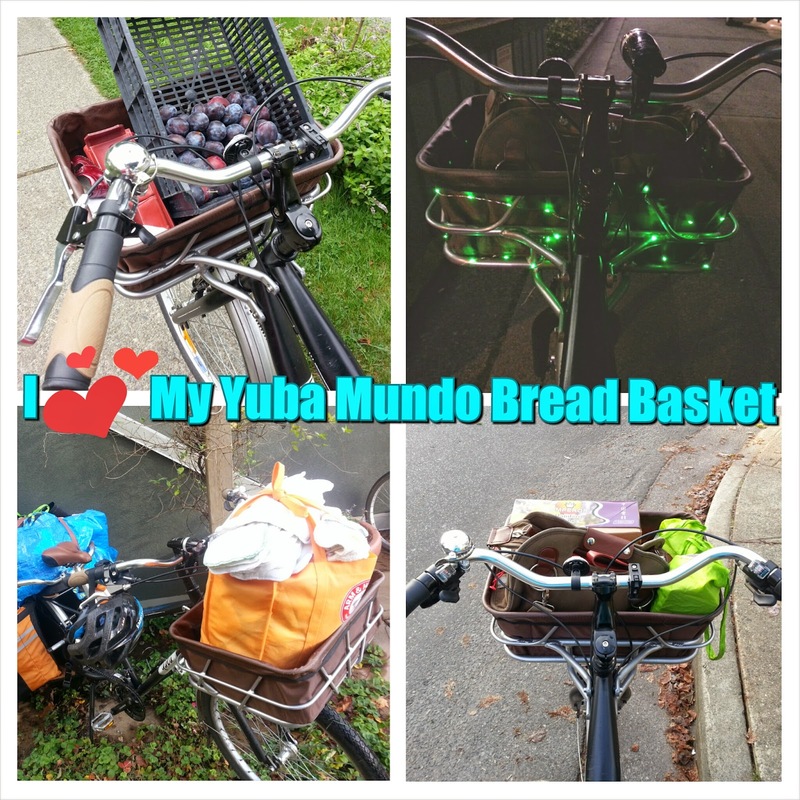 The Yuba Bread Basket comes with a solid liner so you can just chuck even tiny items in it & they won't fall through. More on chucking: the Bread Basket is wide & easy to toss things in. So much simpler than using panniers or carrying things in a backpack. With two small children, saving a minute of pannier-stuffing, attaching & buckling can be a lifesaver. Now, I'm not going to say it's perfect: the plastic inside the bottom of the basket liner is a little flimsier than I'd like & it's started to warp a bit from the weight of the chunky bike lock chain I leave in there. I think the little pocket inside the basket could be improved upon as well--it's made of fairly cheap fabric & doesn't hold much. I'd love to see more pockets around the inside. Disclaimer: I got a discount on our Yuba Mundo from the Bike Doctor, but was not otherwise compensated for writing this post. The opinions & images above are my own! Thanks for your review. Yes I have had the same b Bread Basket since Dec 2014. Its held a whole case of mineral water, at least 50 lbs of groceries plus my 15 lb kryptonite forgetaboutit new york l chain lock. I find that all that weight does affect the steering so you have shift your body weight a bit or load up the side " Go Getter bags. The Yuba design is truly remarkable. Of course what is not mentioned in all of this is developing the " legs" and skill to ride a cargo bike. Many of the " road bikers" that zoom by me uphill fail to realize that I am pulling 5 to 6 times their load. The Yuba is a heavy bike, but I hate those " touring bikes" loaded up with " paniers" totally cumbersome. There is yet to be anything like it on the market.